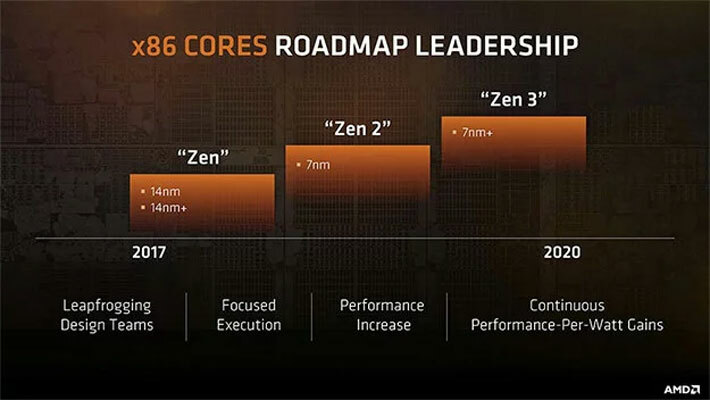 In a surprise turn of events, a new rumor suggests that AMD's planned third-generation Ryzen CPUs built on its Zen 2 architecture might not debut at CES 2019 at all, but will instead make their first appearance at the November 6 AMD Next Horizons event. New Horizons has long been planned as a discussion of AMD's 7nm plans, with many expecting a look at the enterprise Vega 20 GPUs it's been working on and perhaps a hint of Navi's potential in 2019. But now WCCFTech is citing some rumors that suggest we'll see Zen 2 CPUs before the day is out. Just as exciting is the suggestion that AMD's new CPUs are performing better than expected in internal testing too. Purportedly, the new chips are a revolutionary, rather than evolutionary design. Alongside a die shrink to 7nm from the 12nm Zen+ design, Zen 2 could offer as much as a 15 percent increase in instructions per clock, which would equate to a huge overall increase in capabilities. The memory controller is said to be overhauled too, reducing delays and allowing for higher frequency and lower latency memory. Clock speeds too should be on the rise too, with at least a 300Mhz increase, though some suggest we could see even higher, possibly edging towards 5GHz in some cases. If that and other rumors turn out to be true, we could be looking at real 9900K killer chips from AMD in 2019. And we may not have long to wait to see if that's true, if rumors play out that we'll see the chips today. Fingers crossed.